You can watch the best part here. Even the thumbnail is really spoiler heavy, so I will be posting it behind the break. Twisted, in case you're unfamiliar, is the new Starkid musical, Starkid being the group who brought the world other musicals like the A Very Potter Musical trilogy, Starship, or that one about the anthropomorphized genitalia. Twisted takes a page out of Wicked's book, telling the "true" story of Aladdin, casting Jafar as a noble but misunderstood politician, who has to attempt to fix all the problems of the nation, like an incompetent Sultan, the sociopath thief Aladdin, or the well meaning but naive Princess. 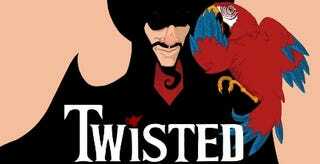 The musical doesn't totally hit the mark, but toward the end comes the titular musical number "Twisted," which I feel stands up with the best stuff the group has ever done. If you're interested, the whole show can be seen, as always, for free on Youtube.